Webhooks are called as the result of an action against assets, entries or content types. Whenever a matching event occurs, Contentful sends a request to the URI defined in the webhook definition. Note: If a filter is evaluating a property which is not present on the entity, it will evaluate to false and not trigger the webhook. E.g. a webhook for topics Entry.publish and Asset.publish filters on a specific content type ID. As assets don't have a content type, all webhooks which are triggered by Asset.publish will be muted by the filter. In the top navigation bar, open Settings → Webhooks. Click Add webhook, configure the remote host, and click Save. You can configure the events that trigger a webhook at the bottom of the screen. This request will create a new webhook in the specified space with a url, name, it will trigger for all topics and will not apply any filtering constraints. When creating a webhook you have to explicitly specify for which changes on your content (topics) you want your webhook called. Any content (of any type) is published. These filters have to be translated into a list of [Type]. [Action] pairs, [*.publish, Asset.delete, Entry. *], and included in the payload that defines the webhook. * is a wildcard character that can be used in place of any action or type. The combination *. * is also valid and means that your webhook is subscribed to all actions across all types. Note: Using * allows your webhook to be called for future actions or types that didn't exist when the webhook was created or updated. Find more details on creating a webhook with the API in our reference docs. The webhook definition holds a filters property. Filtering is a second step after defining the topics. Typical use cases for filtering are enabling a webhook only for a specific environment ID or entry ID. Without a filter, a webhook with the topic Entry.publish is triggering for all entries in the master environment of a space. By applying a filter we could make the webhook only trigger for specific entry IDs within a specific environment. 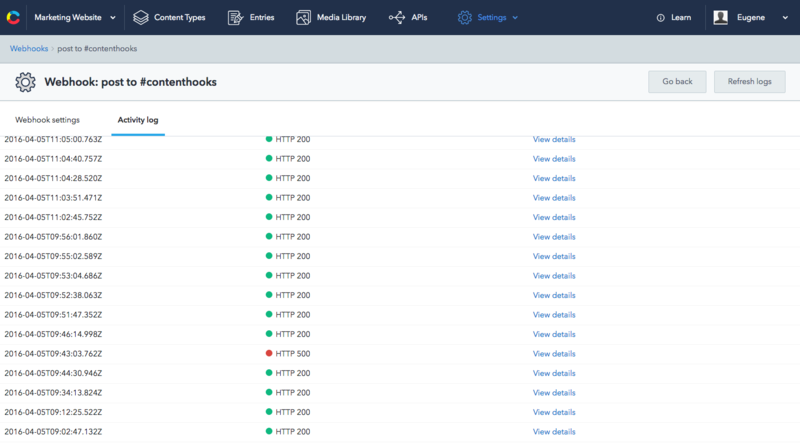 For a full reference on how filters are defined please refer to the webhooks section in the reference documentation of the Content Management API. The Webhooks overview screen shows a list of the most recent webhook calls made, their status, possible errors, and the target URL. Find more details on listing the webhooks in a space with the API in our reference docs. 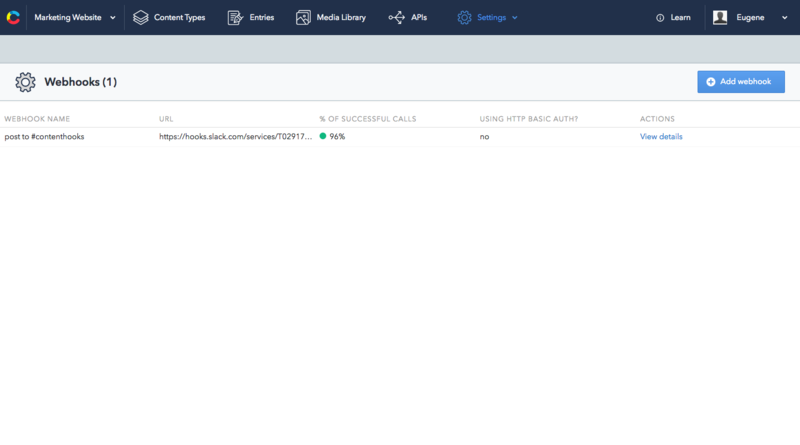 Click the View details link of any webhook in the overview screen to get a detailed activity log, including the JSON and remote server response. The following endpoint will return the status of recent calls made by a webhook and any errors. 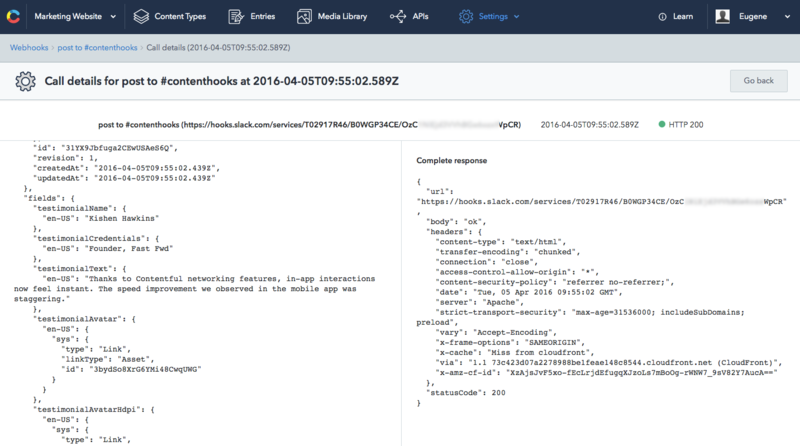 Find more details on getting the activity log of a webhook with the API in our reference docs. The Contentful web app automatically saves documents you are working on after every change you make. Contentful keeps track of documents active in the web app and uses that information to call webhooks you have configured. Contentful considers documents edited in the last 20 seconds as active. This means that, if you are editing an entry in the web app for one minute, and you have a webhook configured to be called for auto_save actions, that webhook will be called 3 times. For local testing we recommend webhook.site to inspect the sent webhooks or ngrok to build webhook consumers on your developer machine. If you want to change any of the aforementioned webhook properties you can use a mechanism called "webhook transformation". Navigate to the CMA reference for more details. All customizable properties can be set with both the API and the Web App.